The first round of presidential elections took place on March 31 this year. Thirty-nine candidates took part in the election. Newcomer to politics, showman Volodymyr Zelensky (30.24% of the vote) and current head of state Petro Poroshenko (15.95%) made it through to the second round. Some 2,157 observers from international organizations monitored the election and made a positive assessment of the organization and holding of the elections. The run-off is scheduled for April 21. 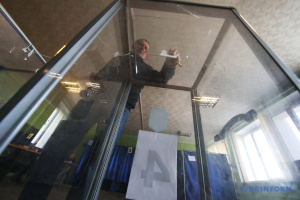 Two weeks after the first round brought a lot of impressions and anxiety to Ukrainian voters. The rivalry of an experienced politician and an unsystematic newcomer pleases those who talk about change and distrust in the old establishment and is the Ukrainian variant of this global trend. At the same time, it appears a bit farcical and quite alarming to those who urge to remember that a war is ongoing in the country and there are a lot of acute problems. Let's try to analyze the situation in detail. Election programs. There are a lot of common things in the election programs of Zelensky and Poroshenko. As for the Russian-occupied Crimea and Donbas, both candidates firmly declare their intention to return the Ukrainian territories and to do so diplomatically. As for the course for Ukraine's membership of NATO and the European Union, Poroshenko calls the year 2023 as the time to apply for EU membership and get a membership action plan for joining the North Atlantic Alliance. Zelensky promises to move to NATO, in particular, to hold a nationwide referendum, and also mentions the European Union in the context of support for Ukraine. Regarding the economy and social sphere. These issues, unlike foreign policy and defense, are within the competence of the Cabinet of Ministers, not the president, but if the government is formed by party fellows and allies of the president in parliament, then it will have an impact on these issues. Both candidates promise social support, the development of the agricultural sector, IT technologies and domestic energy production. Zelensky promises a "zero declaration" for business and a tax on exit capital. Poroshenko has already been submitted such a bill to the Verkhovna Rada and vows to support science. Zelensky promised to open Ukraine to foreign universities. Both of them want to take care of the well-being of doctors and teachers. Poroshenko puts an emphasis on cultural projects and Zelensky on a healthy lifestyle. Both candidates state that they are EU-oriented, socially oriented and democratic. Presidential debate. The word "debate" was the main word heard after the first round of presidential elections. According to the law on presidential elections, a television debate is an obligatory part of the electoral procedure - they are paid from the budget at a determined time (April 19), on a determined channel and in a determined format. But candidate Zelensky said that the debate should take place at a stadium for many people to attend. The Central Election Commission explained that it is possible – an obligatory debate will be held according to law, whereas at any other time, candidates can meet and debate where they agree. Zelensky's "virtuality" and his reluctance to appear in the real world have become a subject for jokes and concern - a few days remain until election day, but virtually nothing is known about the position of a likely president on all state issues, including the most important ones - the war and occupied territories of Crimea and Donbas, foreign policy, personnel issues, fight against corruption, judicial reform. Statements and explanations are made by members of his election team, and there is no certainty whether Zelensky himself will confirm their words. For example, the leader of the Crimean Tatar people, Mustafa Dzhemilev, has already stated that he would like to hear the answer of Ukrainian presidential candidate Volodymyr Zelensky and not his team to five questions that he put earlier regarding the temporarily occupied Crimean peninsula. 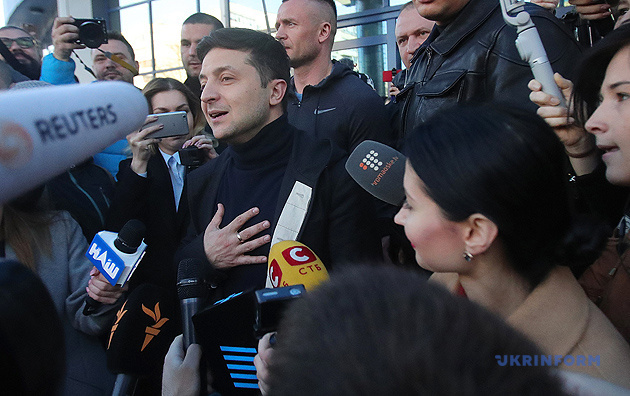 Journalists united in NGO Media for a Conscious Choice and called on Zelensky to show respect for the media and hold a press conference no later than April 18, stating that Zelensky "has personally avoided direct and full-fledged communication with journalists for several weeks." His election team said that the press conference would not take place as the candidate is preparing for the debate. A famous Ukrainian writer from Crimea, Pavlo Kazarin, wrote: "Forget about the debate. [...] The campaign headquarters of Volodymyr Zelensky firmly intends to sell 'a pig in a poke.' And Zelensky is a poke." There's no need to explain this metaphor to Ukrainian voters. Ihor Kolomoisky. Since the very beginning of the election race, Volodymyr Zelensky has been considered a representative of Ihor Kolomoisky - a multimillionaire, the owner of a branched-out business, in particular, the television channel on which Zelensky works, the ex-governor of Dnipropetrovsk region. 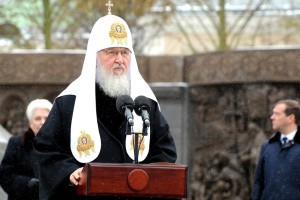 Following his resignation as governor and the nationalization of the largest bank in Ukraine, PrivatBank, owned by Kolomoisky, he now lives outside Ukraine – in Switzerland and Israel - and is considered an enemy of incumbent President Poroshenko. At least the change of power would have been profitable for him. Swiss public television channel SRF was interested in regular visits by Zelensky to Geneva last year, where Kolomoisky lived, and later to Tel Aviv, where the businessman moved to. Swiss journalists point out in their story that against the background of conversations about Zelensky's dependence on Kolomoisky, the current Ukrainian presidential candidate should be concerned about his reputation. The Financial Times also wrote in detail about the connection between Kolomoisky and Zelensky. Zelensky's team categorically denies the candidate's dependence on the oligarch and the intention to bring him to actual power in Ukraine. Teams. Candidates who Petro Poroshenko can nominate for key positions are more or less understandable. He is the current president and runs an election campaign, putting an emphasis on the success of the current ruling team, therefore, he did not declare his intention to change or initiate the change of senior officials. 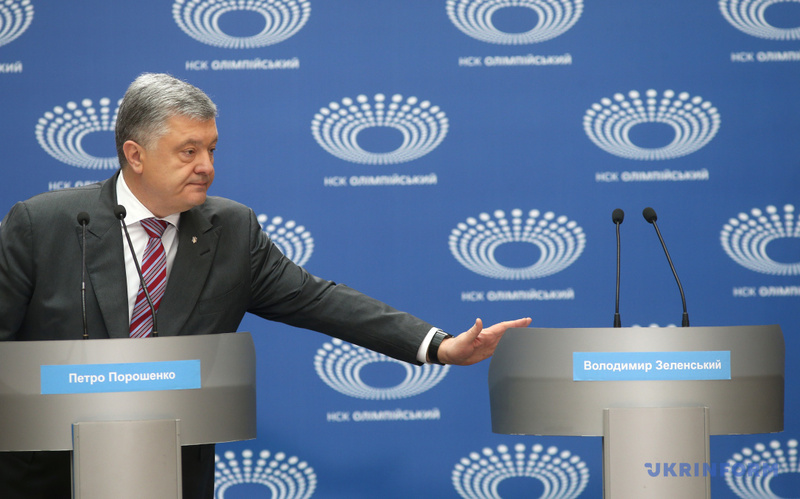 At the same time, commenting on the results of the first round of presidential elections, Poroshenko noted that he had learned a "very important lesson" and, in particular, should change the personnel policy. "These will be young people in my team of the next convocation. [...] Social lifts will be created for them," the head of state promised in his speech on television. The current president also announced a change in the system of local government after amendments to the Constitution on decentralization - instead of the heads of state administrations there will be prefects with fewer powers: the prefects will monitor the constitutionality and legitimacy of decisions of local self-government bodies. Candidates for important public positions from Zelensky are not yet known. The calls for him to name future candidates for the post of prime minister, ministers, prosecutor general, and other important officials have not yet been answered. The only report that appeared in the media with reference to the campaign headquarters of the candidate was refuted by him, and the individuals mentioned as candidates for some posts denied they received any proposals. Opinion polls. Two sociological surveys were released after the first round of presidential elections. One of them was conducted by the Rating Sociological Group, with 3,000 respondents interviewed during April 5-10. 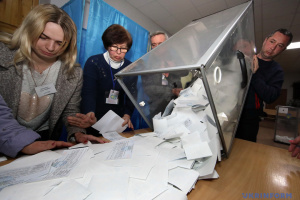 According to the poll, 51% of respondents intend to vote for Zelensky, 21% for Poroshenko, 18% will not vote, and 18% were undecided. The second survey was conducted by Kyiv International Institute of Sociology (KIIS). 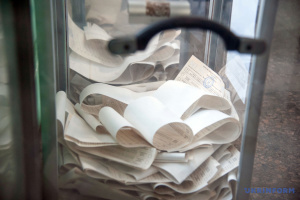 According to the poll, 48.4% of respondents have already decided to vote for Zelensky, 17% for Poroshenko, 6.3% are not going to vote, 17.9% were undecided, and 8.8% refused to answer. 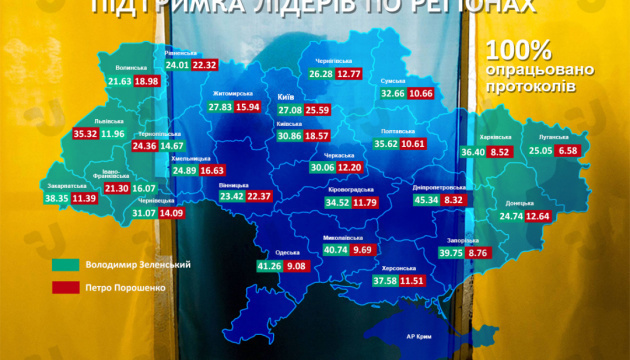 It should be noted that sociologists in Ukraine were much criticized for the unreliability of their figures. They were suspected of adjusting the results in favor of those who ordered such surveys. However, rather accurate exit polls after the first round, which almost coincided with the official election results, have increased confidence in them. Political rivals of both candidates. Almost all the politicians who took part in the first round made statements that they did not support any candidate in the second round and would not reach agreement with any of them. The matter is that parliamentary elections are due to be held in Ukraine on October 27 this year, and politicians do not want to either damage their reputation by temporary alliances or strengthen the positions of their rivals ahead of elections to the Verkhovna Rada - the parties led by Zelensky and Poroshenko. The Verkhovna Rada, according to the Constitution, has significant powers. In particular, it is impossible to appoint a prime minister without its consent. The parliament may also reject the president's legislative initiatives and override his veto on certain laws. Thus, politicians, even having lost the presidential election, have the opportunity to gain significant influence in the country if the party of the elected president - whoever he is – does not have a majority in parliament.